In medium bowl, place beef; sprinkle well with salt and pepper. Add eggs, bread crumbs, Parmesan cheese, garlic and parsley; mix lightly until combined. Shape mixture into 12 (2-inch) balls. In 3- to 4-quart saucepan or Dutch oven, heat oil over medium-high heat. Add meatballs; cook 2 minutes on each side or until golden. Pour marinara sauce over meatballs. Heat to boiling; reduce heat to low. Simmer uncovered 30 minutes until meatballs are thoroughly cooked and no longer pink in center. 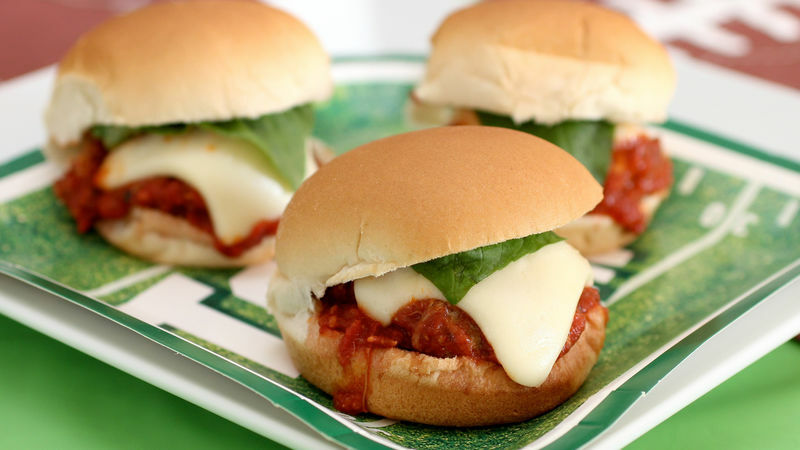 On each bun bottom, place 1 meatball, 1 slice mozzarella cheese and 1 basil leaf. Cover with bun tops. Ground pork can be used in place of the beef, or for a lighter version use ground turkey or chicken. If you double the recipe, brown the meatballs in batches and then add them back to the pan with only 6 or 7 cups of marinara sauce.